Stan Rodriguez, started with the Advocates as an apprentice to Juan Mesa, fluent Kumeyaay speaker and renownked Wild Cat song singer. 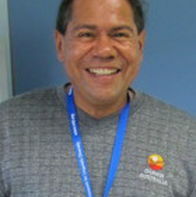 He is currently teaching Kumeyaay at Sycuan College and at various tribal locations. My name is Rev. Dr. Stephen Albert and I am the chairman of a North American interfaith conference happening at UCSD from August 6-10. This conference is bringing together 200 people from over 20 faiths to meet and talk about how to bring Harmony to the world. I spoke with Elena Hood, Director of Internal-Tribal Resource Center at UCSD 10 days ago. She suggested that Stan Rodriguez might be willing to offer a Native American Blessings at the opening of our conference on Sunday, August 6th at 5:15pm +/- in the West Ballroom of the Price Center on the UCSD campus. We are about to print out our conference brochure this Wednesday (7/19) and I would like to include the picture and bio we have for Stan in the brochure copy. Please get back to me to let me know Stan is available and is willing to bless us with his words. We would also like to offer him dinner that night for his time.